Today I'm sharing another fashion illustration with you. The medium is acrylic on cardboard. 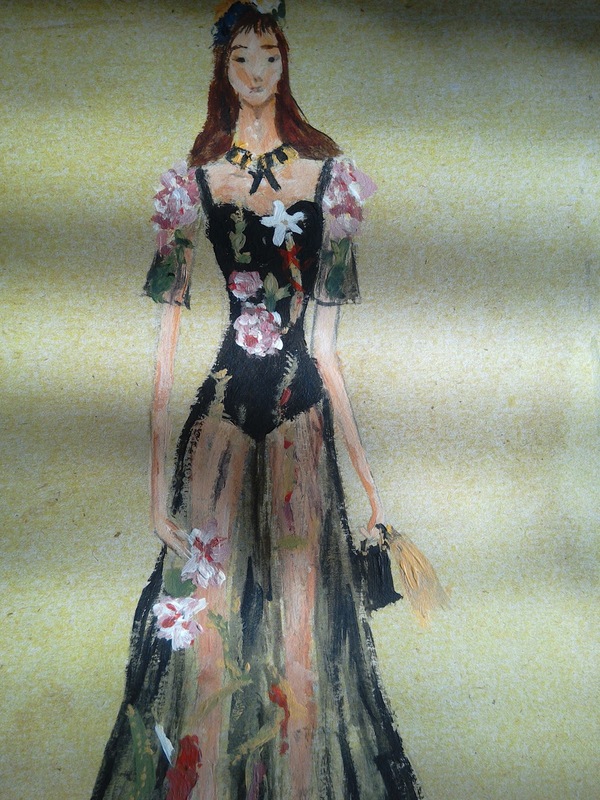 I illustrated a dress from Dolce & Gabbana Autumn/ Winter 2017/ 2018 collection. 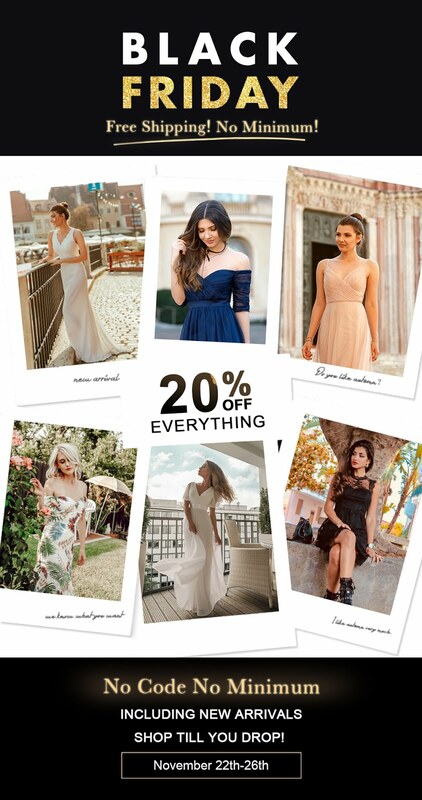 Have you seen this collection yet? I always end up liking DG collections. I suppose it is their Mediterranean aesthetics that appeals to me. I have a feeling that really know how to integrate Mediterranean cultural references in their designs. I always like to see a bit of folklore influences when it comes to fashion. Keeping a connection with tradition can be such a wonderful thing. Anyway, if you're interested in checking up some of my other works related to DG, I previously illustrated two runaway looks from this brand (here and here). One more thing.... the first person who leaves me a comment saying they want this illustration, will get this illustration as a gift. I'm not sure about exact dimensions, because I used cardboard from the cover of one of sketching blocks for it. I think it is pretty close to A4 format...but hey you can cut it to any size you want. Danas sa vama dijelim još jednu modnu ilustraciju. Medij je akril na kartonu. Ilustrirala sam haljinu iz kolekcije Dolce & Gabbana za jesen i zimu 2017/2018. Jeste li vidjeli ovu kolekciju? Meni se njihove kolekcije uvijek sviđaju, valjda mi se dopada njihov mediteranski osjećaj za estetiku. Imam osjećaj da uvijek znaju uklopiti mediteranske kulturne utjecaje u svoje dizajne. Uvijel volim vidjeti folklorne utjecaje kada je moda u pitanju. Odražavati vezu s tradicijom može biti divna stvar. Zanimaju li vas i moji drugi radovi na ovu temu, već sam ilustrirala dvije kombinacija s piste ovoga branda (ovdje i ovdje). Još samo nešto....prva osoba koja mi ostavi komentar da želi ovu ilustraciju, dobit će ovu ilustraciju na poklon. Nisam sigurna koje su točne dimenzije jer sam koristila karton s poleđine bloka za crtanje, mislim da je približno A4, uostalom možete je izrezati i u neki drugi format. thank you, I followed you back. You are so talented Ivana. This painting is so beautiful! You did an amazing job of translating the D and G look with acrylic and cardboard. What do you do with your paintings when you are done with them? It depends, if I really like them then I frame them and hang them up....but I don't have enough space on my walls for all of them so I sometimes give them to friends so they can hang them up:). I also sent a few of them to fellow bloggers. Hi Ivana! I haven't seen this collection yet, but I think that it's a matter of time - every season I end up liking Dolce&Gabbana's collection as well - I'm so in love with their colorful and feminine projects :) You did great work on this illustration - it looks pretty amazing, what's more I love the details of its - that outfit looks realistic and in my opinion you're getting better and better and painting, dear friend. thank you dear:) I love how colourful they often are...and when they do all black looks, they're always super feminine...so either way, I love their designs. I have seen similar dresses in some online shop and I must say that they caught my eye. Evooo je, apsolutni favorit dosad! <3 Samo nastavi u ovom tonu, sve divnije i divnije ti izgledaju ilustracije (jesam li to rekla već jedno desetak puta? nema veze, istina je!)! 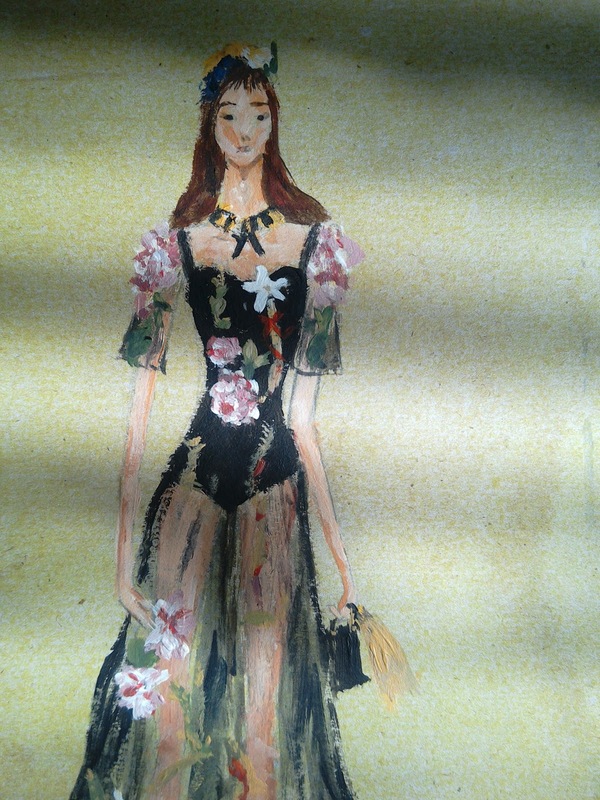 I love Dolce & Gabbana's collections. This dress is very beautiful! Lovely painting. 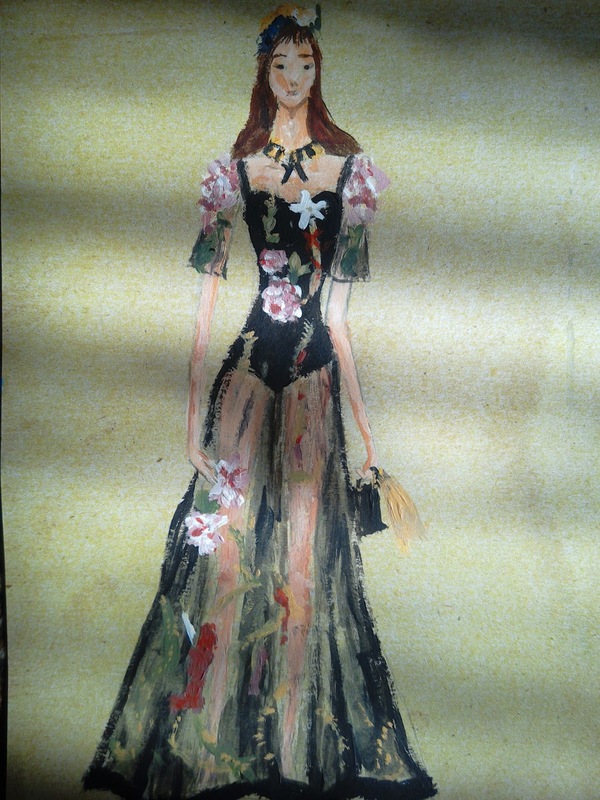 Your sketch is just too pretty, and do love that sheer dress too by D&G! Anche io adoro le collezioni Dolce & gabbana, forse sono un pò esagerate di tanto in tanto, ma trovo che esaltino comunque alla perfezione la femminilità delle donne! Il tuo disegno è davvero bello, sei stata bravissima nel rrendere così bene le trasparenze ed i dettagli, non è una cosa così semplice da fare! 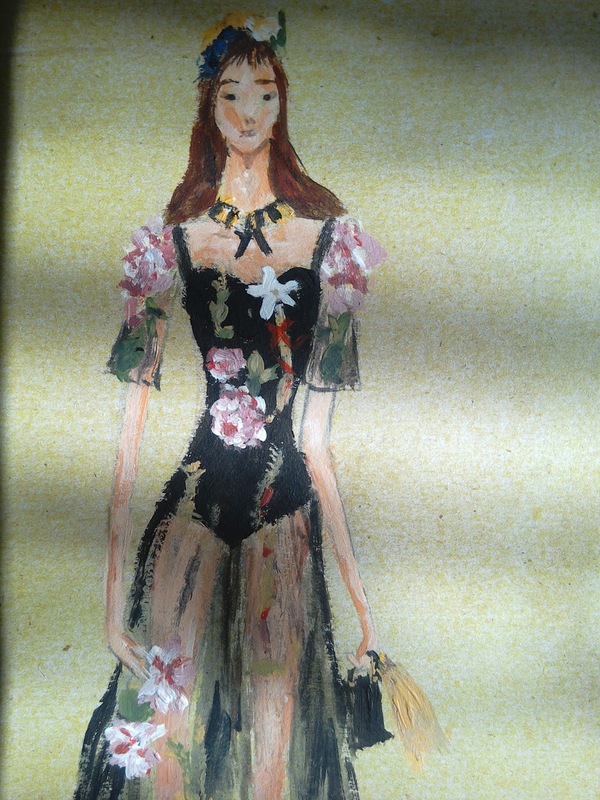 When I saw your artwork I immediately recognized the Dolce & Gabbana influences. You captured the essence of their last few collections perfectly. Tu mi conquisti con questi vestiti che hanno trasparenze così romantiche. 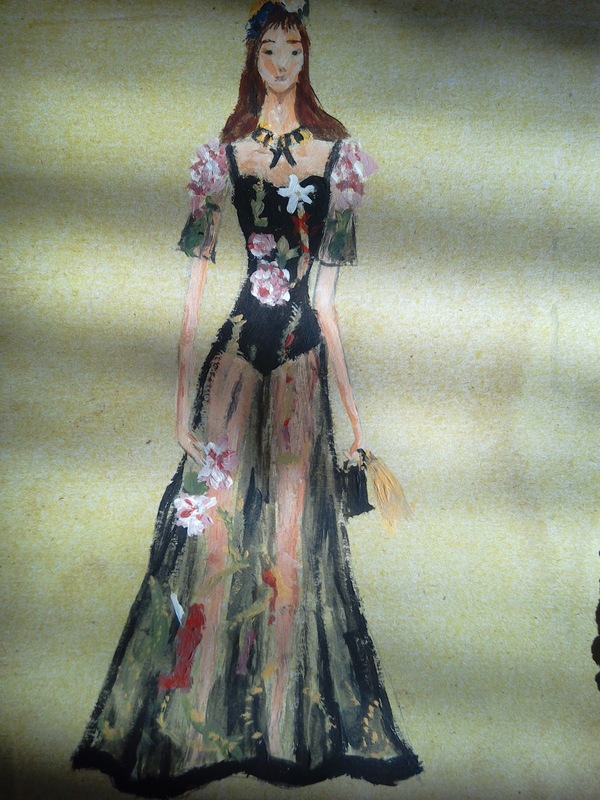 Actually, I watched the show and this dress in particular is most beautiful. Good job, Ivana. thank you Lenya. This dress is my fav too. very beautiful illustrations! I see you have improved a lot, this one is full of details! Years ago, when I used to spend my days drawing fashion mannequins, this brand was one of my biggest inspirations, their clothes are so beautiful! Admire you how you describe the see-through tulle part! Are notorius the traces from Dolce & Gabanna! Top! Your illustration turned out perfect and I love how you made the details. Thanks a lot for sharing this beautiful illustration. thank you sweetie. I would probably buy their entire collection if I could. Thanks so much for sharing this with us and for all the inspiration! I'm sad I didn't arrive in time to keep it :p It's beautiful! Your illustration Ivana is so beautiful. I love D&G Collections. I haven't seen the recent one so I will have to look at it. I'm sure you will like it:):). thank you....I can understand you. I prefer not to spend much on clothes but I suppose that if I had unlimited funds, they would be my choice. It's true that D&G collection often reflect a strong Mediterranean aesthetic but it makes sense since the designers are Italian but still they do it in a way that feels authentic and it feels right for the brand. You did a fantastic job with this illustration! Ages ago, I lived (for work reasons) in Sicily for four months and that is exactly what I see when I look at their designs- Sicily. This is really super gorgeous! Just stopping by wishing you a fantastic day, Ivana. Wow! Beautiful picture! Stunning dress! Can I just tell you for the one millionth time just how amazing these illustrations are. You captured the essence of the brand beautifully. I am in awe!